Wisteria is a beautiful addition to any garden. 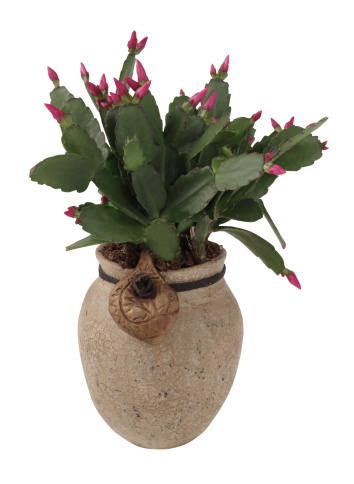 It grows rampantly in several different climates. It is a fairly easy plant to care for, as it can be positioned to climb up trees, walls or a trellis, needing precise pruning in the first two years. After two years, wisteria can grow as it pleases without much care. Planting wisteria against a trellis provides an attractive blossom-covered area, but it is important to secure the Wisteria vines to the trellis for sturdy support. 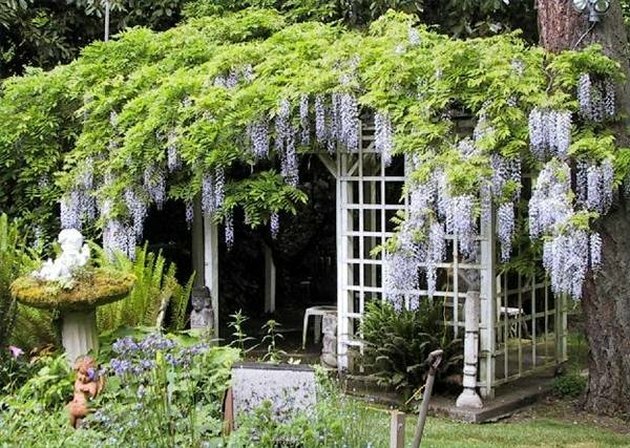 Since wisteria can grow very high, you will want to build the trellis up higher than a normal one. Keep in mind that there could possibly be a need for additional building to the trellis within a couple of years. Map out a large area of your yard where you wish to plant the wisteria. It can grow very high and spread quickly. Plan ahead. Measure out an area that is at least 6 feet wide by 6 feet tall. The ideal place for your wisteria trellis is on a sturdy flat wall where the trellis can be secured. Put the work gloves on to avoid injuring your hands. Lay down the five pieces of wood that are 2 inches wide by 5 1/2 feet long. Place them side by side on a flat working space, with their edges even at the top and bottom. Next, use the tape measure to space each of the wood boards 7 inches apart. Pick up the wood boards that are 2 inches wide by 5 feet long as a pile. One by one, lay each of these boards across the evenly spaced out boards that are already on the ground, creating a tic-tac-toe pattern. Start at the top, and lay the first board perpendicular across the other boards about six inches down from the top edges. Take the second board. Place it 5 inches down from the first perpendicular board in the same manner. Repeat this procedure with the remaining boards. Make sure all the edges are lined up and that the boards are even and straight across to resemble a large, precise tic-tac-toe board. Use the hammer and nails to secure the perpendicular boards to the bottom boards, using one nail in the middle of each intersection. Add more nails in areas that seem loose or rickety. Lay the trellis against the wall. Use the level and map out on the wall where the wisteria trellis will be secured, using a marker to mark the points where you will secure the wisteria trellis. The trellis should be at least 5 inches from the ground to the bottom of the trellis for the wisteria plants to anchor themselves. Use the electric screwdriver to insert three to four hooks into the wall (the hooks should hold the trellis on each side, and in the middle). Hang the wisteria trellis on the hooks carefully, making sure that it will be secure. Weave the wisteria vines or branches through the bottom of the trellis as much as possible. Secure the larger branches with twine to the wooden boards, making sure not to tie too tightly. As the wisteria grows, weave the vines more into the trellis and secure larger branches with twine. This is necessary because the wisteria needs a sturdy hold to grow besides the trellis. Lauren Wise has more than eight years' experience as a writer, editor, copywriter and columnist. She specializes in food, wine, music and pop culture. Her writing has appeared in various magazines, including "Runway," "A2Z," "Scottsdale Luxury Living" and "True West." Wise holds a Bachelor of Arts in journalism from Arizona State University.